The management company is readying two more clinics in Raleigh. From left, Dr. George Ghneim, Vets Pets co-founder Steve Thomas and the new Longview hospital. Vets Pets, a North Carolina veterinary hospital network, has entered the city of Raleigh with the first of three clinics. 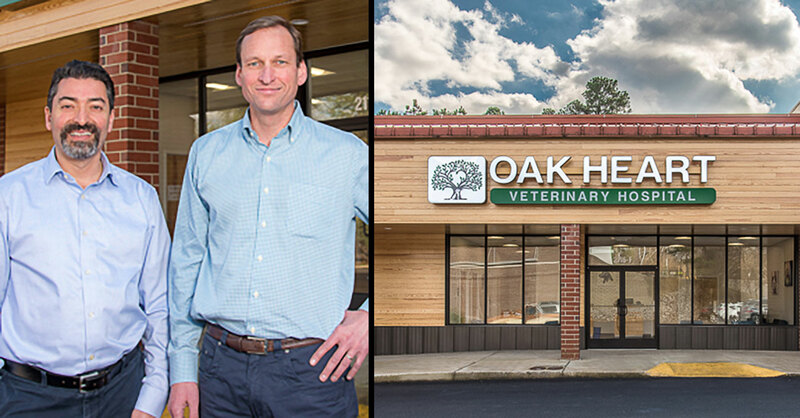 Oak Heart Veterinary Hospital at Longview celebrated its grand opening Jan. 26 and will be joined later this year by Oak Heart clinics in the Dixie Trail and South Saunders neighborhoods. The three Raleigh hospitals will raise Vets Pets’ holdings to 25 hospitals in central and eastern North Carolina. Vets Pets described Longview’s lead veterinarian, George Ghneim, DVM, Ph.D., as a business partner. The company handles the hospital’s practice management responsibilities, such as human resources, continuing education and equipment purchases, allowing on-site staff to focus on patient care. Oak Heart Longview, a 3,200-square-foot facility, and the 10,000-square-foot South Saunders location, set to open in October with day care and training services, are newly constructed. The Dixie Trail hospital is being remodeled in time for a spring opening. Joining Dr. Ghneim at Longview is Dianne Saladino, DVM, and veterinary technician and office manager, McKenzie Paschal, RVT. The Dixie Trail location will be staffed by veterinarians Virginia Brown, DVM, and Kelly Neri, DVM.